This is a Royal Gala apple grown in the Annapolis Valley in Nova Scotia. Isn't it a beauty? 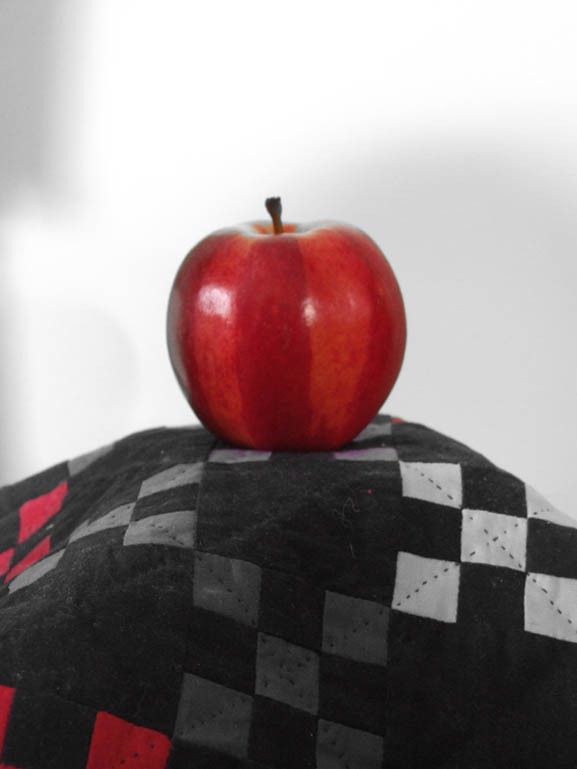 I put it on a pedestal (which is where my quilts usually are too *-), photographed it...and then ate it for lunch. 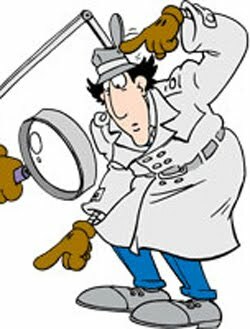 Fortunately, we had lots of willing and eager teenage muscle show up to assist in the late-night caper and we are very grateful for their energy and enthusiasm.There were multiple sting casualties but no one seemed to mind. The bees will now settle down to enlarging and capping their honey stores. 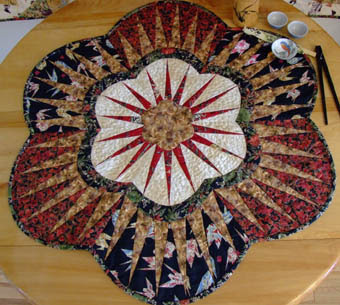 As for the Garden Salad in the title, that refers to a free placemat pattern being offered by Bev at The Quilter's Net. If you'd like a copy of the pattern, simply click this link and subscribe to the newsletter before midnight Saturday, July 31 and the pattern will be mailed out to you, gratis. Who wouldn't like Garden Salad in this weather? Carol works with The Bernina Lady and is part of "The Motley Crew", a stitching group made up of Bernina users which meets regularly at Avonport Fabrics. 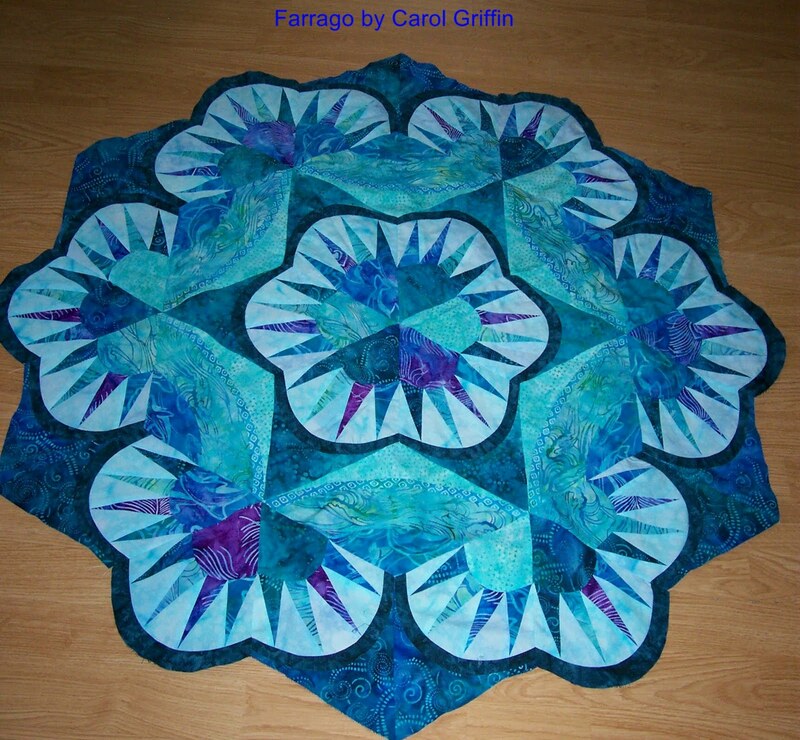 Beautiful job, Carol - can't wait to see how you quilt this! The latest Sew Karen-ly Created... newsletter has gone out...and a few came back again, rejected by mail servers. 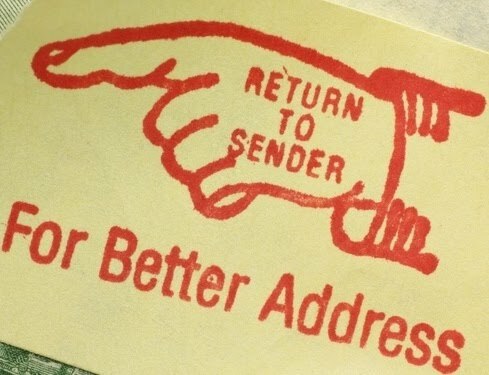 If you have signed up recently to receive the newsletter and yours has not arrived, kindly add my address to your contacts or "safe" list and let me know to resend. 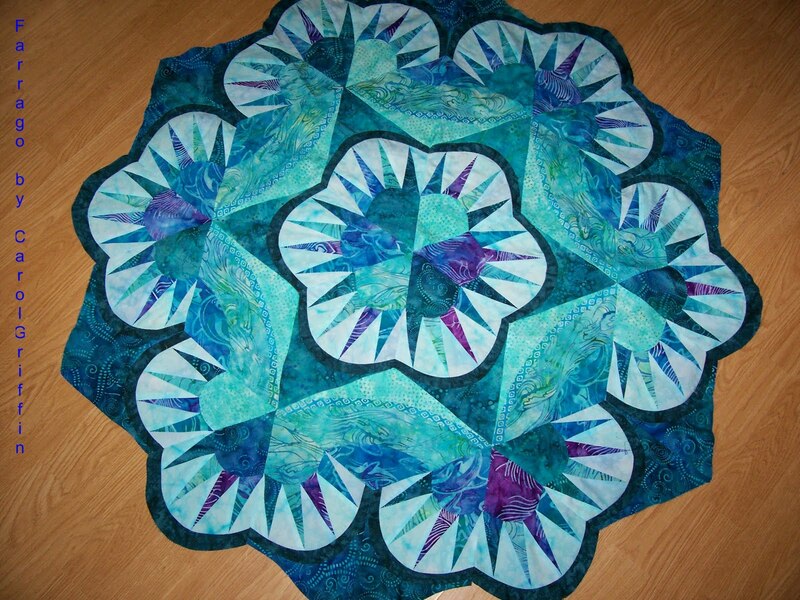 No, I'm not depressed - my quilts just seem to be singing the blues lately. In what can only be described as "quilting ADD", multiple projects are always on the go. Yesterday I woke up with an overwhelming urge to sew silk, so I drafted a new design out in EQ7 and have the first block completed. The last blue pile is the log cabin quilt from last week. Blue is a special colour for Nova Scotia; not only do we find it in our tartan, we see it everywhere - blue skies, blue waters and blue berries. Hubby placed the home owner's stepladder underneath the branch, and I held the nuc box (containing frames of honey) as he shook the branch of bees into it. We left the nuc there for the cloud of bees to settle into. It didn't take them very long to decide this looked like a good place to set up housekeeping. The swarm was a bit smaller than the previous one, but still a nice lot of bees. We left the bees alone for an hour or so and when we came back, they were ready to pack up. Can you find the queen? This one is striped (not all are). The nuc was left overnight, and in the morning hubby transferred them into a regular big box for them to begin to grow their colony. The old adage tells us that "a swarm in July isn't worth a fly" meaning that these bees will spend the rest of the season building up their strength in numbers, and not make any honey in our short season. However, with luck they should be ready and strong for next year. We hope that's it for Queen Street swarms! We are back from a few enjoyable days on The Island. Imagine our surprise to see this sign shortly after we arrived! Ok...it obviously wasn't for us, but it made us feel very welcome! We left the Trans Canada to reach Charlottetown, opting instead to drive along the shore. We didn't spot any beehives, but certainly this would be an idyllic location. Everywhere, we saw potatoes in bloom. Field after field of potatoes... I wondered what the honey from potato blossoms would be like? On our return, we stopped to take some photos of The Confederation Bridge. These are taken from the New Brunswick side. We even found a vantage point where we could walk underneath the bridge. It is a massive structure, to say the least. At the Wool Sweater Company in Rustico Bay, I discovered some Briggs and Little Durasport sock yarn in a new shade: Rosewood. I bought enough for two pairs of socks. This should pretty much do me for sock yarn for a bit. I am on the foot of the first in the carnation pair being knitted with On Your Toes. Ever wonder what would happen if you took lush berry-coloured balis and tossed them in the blender? You'd get this fabulous fabric fruit smoothie!This stunning piece of art is surprisingly simple to sew. It uses only one block and the gentle curve requires no special machine foot. Fruit Smoothie is one of the quilts I designed for the the Benartex booth at Quilt Market in Minneapolis, and the pattern is now available. You can purchase it online here, or stop in to Timeless Stitches in River John. Are You A Gadget Person? Most who know me will agree that I'm not really into gadgets. On a good day there are perhaps 6 straight pins to be found around here, and earlier this year I shocked a quilt chat group when I divulged that I use the same ruler for everything. Even more shocking, I must also admit that I never had a seam ripper until the one which came with the Bernina last December. (My feeling on that issue was that if I had one I'd find ways to use it, and sure enough - hasn't that theory proven true!!) 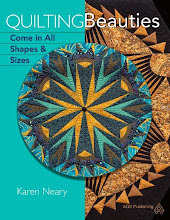 However, there are some pretty nifty tools out there in the quilting world and it's fun to read about the ones which work. 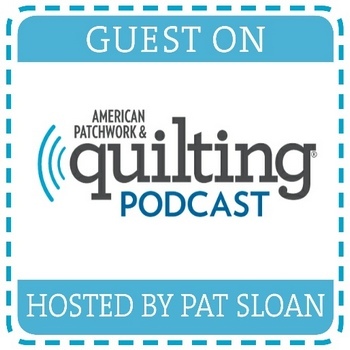 Bev Crouse of The Quilter's Net and I have had a great time writing articles for each other's newsletters. 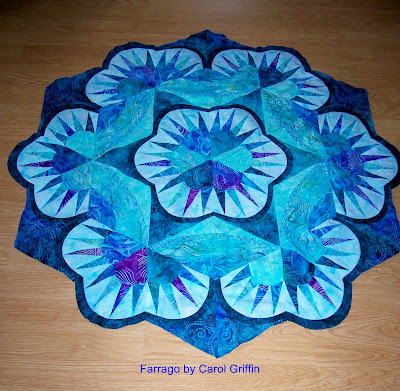 Mine for her was on time management (if you'd like to read that, scroll back through the postings on The Quilter's Net blog to find where to sign up for a copy). I was delighted when Bev chose "gadgets" as her topic because let's face it...that isn't information anyone will get from me! Bev's article will be included in the next edition of the Sew Karen-ly Created...newsletter, which will go out to subscribers shortly. 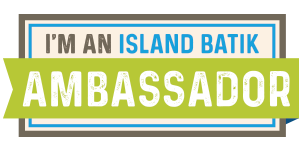 If you'd like your name added to the list, simply email and we'll send along the newsletter when it's ready. With school over for the season, the home schedule changes and I try to go with the flow. It's nice to slow down a bit and do some fun projects. The socks are coming along nicely. I finished one of the thick, wool plum coloured ones and started in right away on the new wool. I will go back and finish the second plum sock later. The carnation coloured ones have the heel flap finished and are ready for the heel shaping. This is something I have to follow written directions for, row by row, so in the meantime cast on the blue/green yarn as I can do the leg by rote. Working socks this way makes them the perfect, portable hand project. 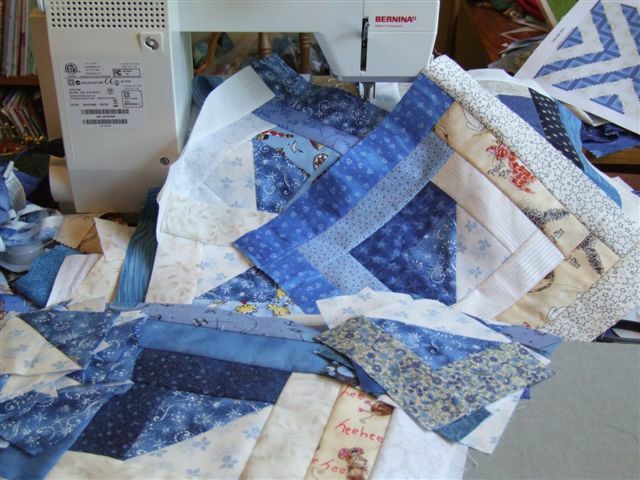 On the sewing front, I am using up some blue and white scraps to make a log cabin quilt. The whites will range in tone from pure white to light tan. It will be a twin size, 6 x 8 and thus requiring 48 blocks. 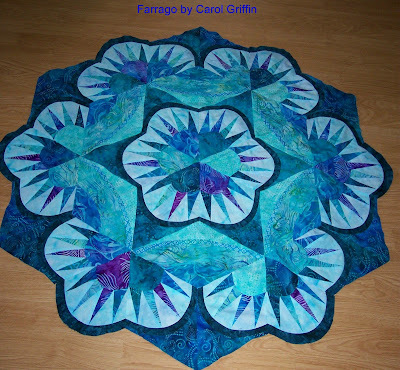 The centres are half-square triangles, and the blocks will be joined together in a X setting. 27 blocks are pretty much complete, as well as all the centres. Using 1-1/2" strips makes the project a quick and enjoyable one. My deadline for this quilt is June, 2011; what a luxury to have so much time to work away on it. 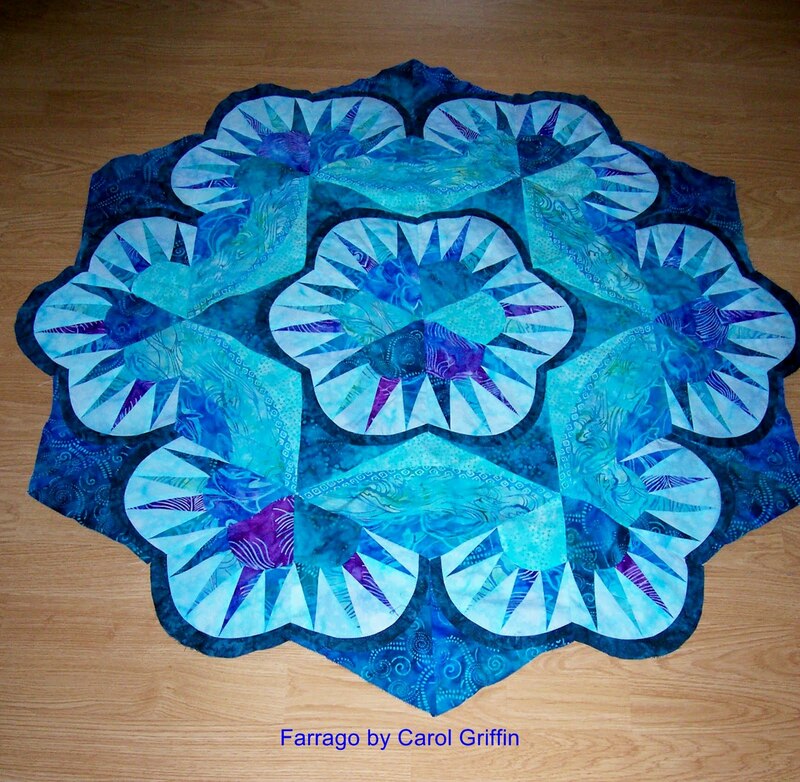 My other projects for the summer so far include finishing an article for an upcoming edition of Quilter's Connection magazine, as well as stitching samples for the Meadow Song workshop to be presented at the N.S. Fibre Festival in October. We've been swarm chasing again...first there were two calls from within our town (one in the eaves of a 2-1/2 storey house, the other in a lilac bush) but both times the bees moved on before we got there. The third call was different...it was hubby's own bees! Oddly, we had been to check the hives early that morning (Canada Day) and things seemed fine...although we both noted a lot of space in one box. As the sun was shining, we put it down to the bees being outside gathering pollen. We were barely through the door at home when the blueberry farmer called to say he had spotted a black cloud of bees moving across the field. Oh, oh...that's not good. We loaded the gear and went back to check. Sure enough, the bees had landed on a low branch of a tree across the field from the beehives. Hubby shook the branch into the nuc box and the bees began trailing in. He spotted the queen and it seemed an easy capture. When we returned later that evening to close up the nuc...the bees were all gone. We searched extensively in the fields and trees but they were no where to be seen. Shoot...Still hopeful, we left the nuc for overnight. Returning early the next morning, still no sign of the bees so we removed the box and headed home. Not an hour later, the blueberry farmer called again to say the bees were back in the same spot as yesterday, except this time on the ground instead of in the tree. It's hard to get bees up off the ground. We began the slow task of brushing and moving the bees, almost one at a time. We spread a white sheet under the box to make it easier for them to discern where they were headed. Bees don't see terribly well. When most of the bees were on the sheet, we picked it up and "poured" the bees gently into the nuc. There were still a great number of airborne bees, so no sense in closing up the nuc until everyone was inside.